The NRA’s Program Materials Center now offers high-visibility vests for both Range Safety Officers (RSO) and Chief Range Safety Officers (CRSO). These $25.00 fluorescent yellow vests come in three sizes, all with reflective strips and “NRA RSO” screen-printed on the back of the vest. We strongly recommend that clubs consider providing Hi-Vis safety vests to Range Safety Officers. We’ve noticed that when range-masters wear official safety gear (and carry a bull-horn), everyone on the firing line seems to stay more alert. If the RSO needs to go downrange, the enhanced visibility of the vest helps ensure that shooters, particularly novices, handle their firearms safely. In addition to the bright yellow vests, the NRA sells fluorescent yellow caps ($9.75), yellow or orange knit caps ($17.00), and bright orange shirts ($14.95- $24.95) for RSOs and CROs. These items are all offered through the Program Materials Center. Share the post "Hi-Vis Safety Gear for Range Safety Officers"
For what the NRA charges us to become an RSO and renew every two years, you’d think these would be included. Editor: Looks like the NRA has moved some RSO gear to the NRA Store. We can’t find the vest — it appears to be out of stock. 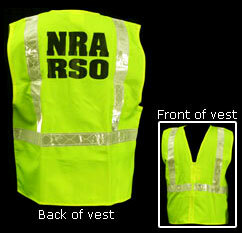 NRA strongly encourages the vest but doesn’t sell it. Too much to ask, but could they at least provide a link to a site that sells a similar product?